I have been a little behind with posting my Christmas cards. I did make quite a few this year, but time slipped away from me and I didn't get them posted as planned. This card was created for my friend Veronica using the beautiful Penny Black leaping deer image. On a piece of Shimmery White paper, cut from a Spellbinders Large Classic Square, I stamped the image in VersaMark and embossed it with gold embossing powder and a heat gun. Believe was stamped in Blushing Bride and embossed with clear embossing powder. I cut a piece of Brushed Gold paper using the Lacey Square #5 die and mounted everything to a white linen card. A bow was made from 7/8" musical ribbon. 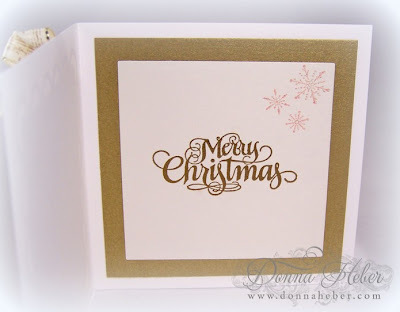 Merry Christmas was stamped in VersaMark and also embossed in gold. A few snowflakes were added in Blushing Bride with iridescent ice. I went for the simple and elegant look. Thank you for stopping to visit me. I hope 2013 brings you much joy and happiness! Don't forget to enter my giveaway for a charming heart necklace. I'm linking with Make It Monday. This is really beautiful! Something I know nothing about! Happy New Year! Awww, so pretty. Makes me want to start making christmas cards right now, so i can have them for next year. Your card is gorgeous, Donna! How special the recipient will feel, receiving a card designed especially for her. The card is beyond beautiful! I'm really blown away by it! Happy New Year! Donna, this is beautiful! 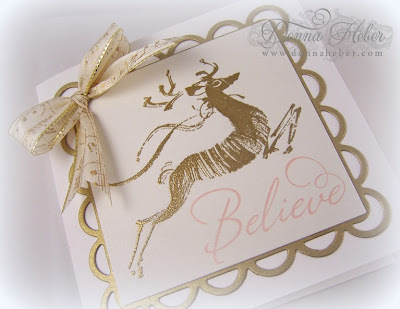 I love that leaping deer image, and you've used such beautiful colors to highlight it. Gorgeous! Happy New Year to you! This is so elegant in the gold and white. Love the ribbon. very beautiful Donna, love that ribbon too. I love it! A very sophisticated take on the Christmas card. I love the deer theme at Christmas. Beautiful cards! I love that you made them, so much prettier than store bought! I love your reindeer card. I didn't make cards this year. Have so many made already I am waiting until I use more of them up! Happy New Year! Hi Donna, thanks for visiting me at my Life on the Funny Farm blog! Your Christmas cards are beautiful! 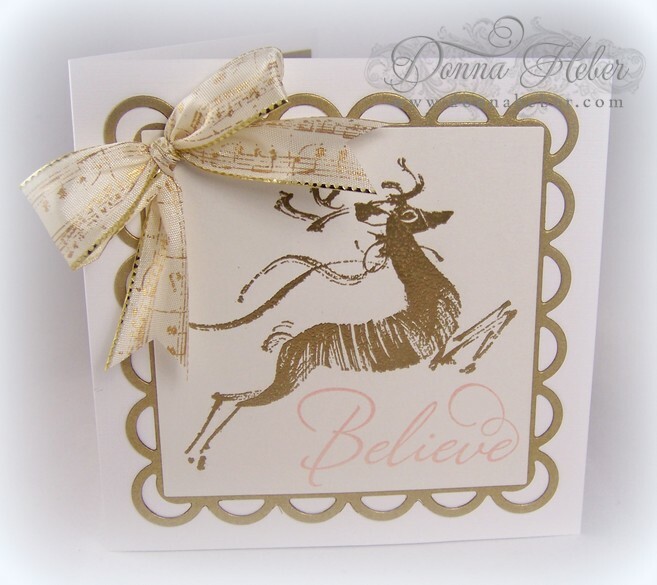 Very classy and elegant card Donna, love the image and details..lovely. Beautiful card Donna very elegant, I've popped over from MIM. Just popped over from MiM to take a closer look at this super elegant card. What a fantastic stamp. Your card is gorgeous! I saw it on MIM and came for a closer look. Love it. I saw it on MIM and had to get a closer look. Great job.